The Quad Cities where art and fun combine. The art and culture of this River town along the big Ole Mississippi called to me. Whether you are enjoying Moline, Illinois which was once home to many of the greatest machinery giants and checking out the John Deere Commons or enjoying a meal at the Bent River Brewery there is a lot to see and do in the Quad Cities. One of my favorite haunts is Lagomarcino’s which was established in 1908 by Angelo Lagomarcino, an immigrant from Northern Italy. Today they offer great light lunches but oh the desserts! This candy shop and ice cream store in the old fashioned setting is simply yummy! If you don’t catch Lagomaricons in Moline you can still find a newer but still tasty version in Davenport’s East Village which also offers cool little shops. Details are available at http://www.lagomarcinos.com/history.php. Davenport offers up the renowned Figge Art and then there is the Putnman museum as well which was filled with an array of dinosaurs when I visited. Also in Davenport is the beautiful old Blackhawk hotel is fun to check in dine or just browse the lobby. The statue in the picture above is outside the German interesting German American Heritage Center. 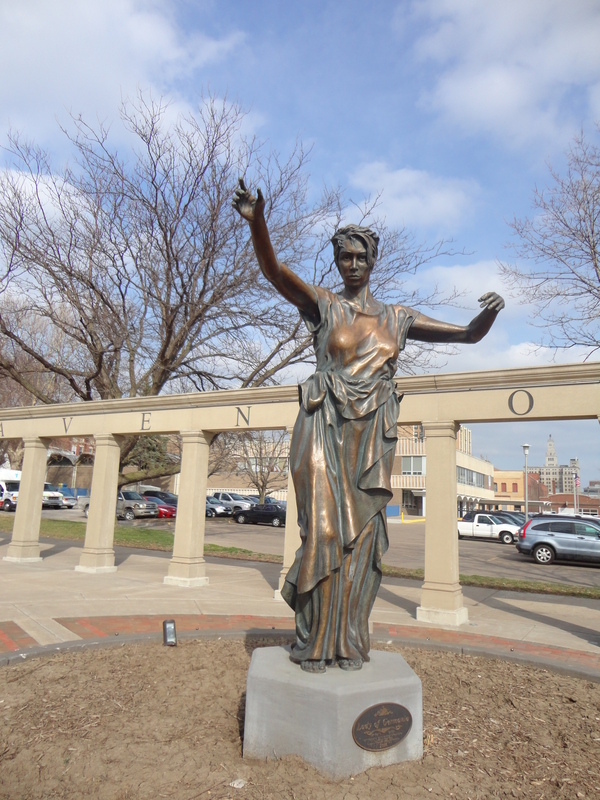 The statue is titled Lady of Germania and she was created by Jeff Adams with clay and then cast in bronze in multiple pieces at his studio and foundry in Mount Morris, Illinois. Log onto www.visitquadcities.com or call 1-800-747-7800 for more information!